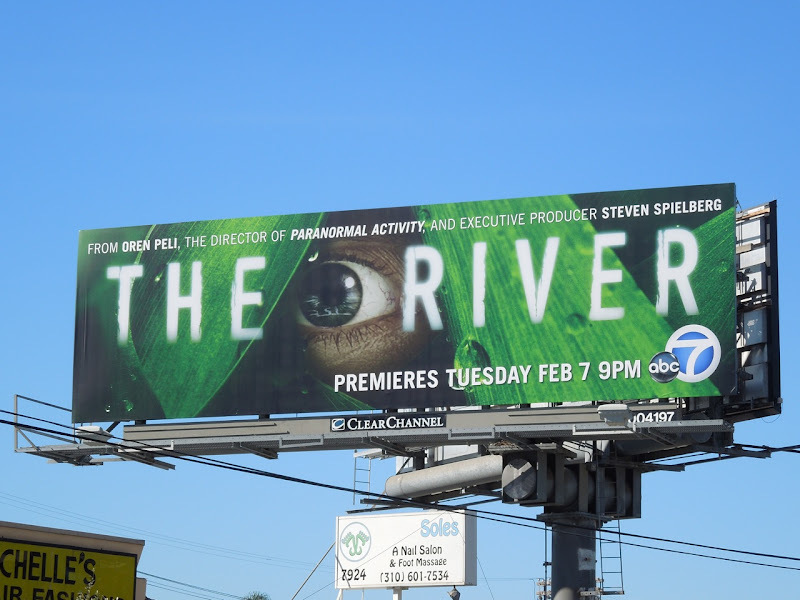 You know you can expect some shaky cam in the jungle with The River, if Oren Peli of Paranormal Activity fame is involved. 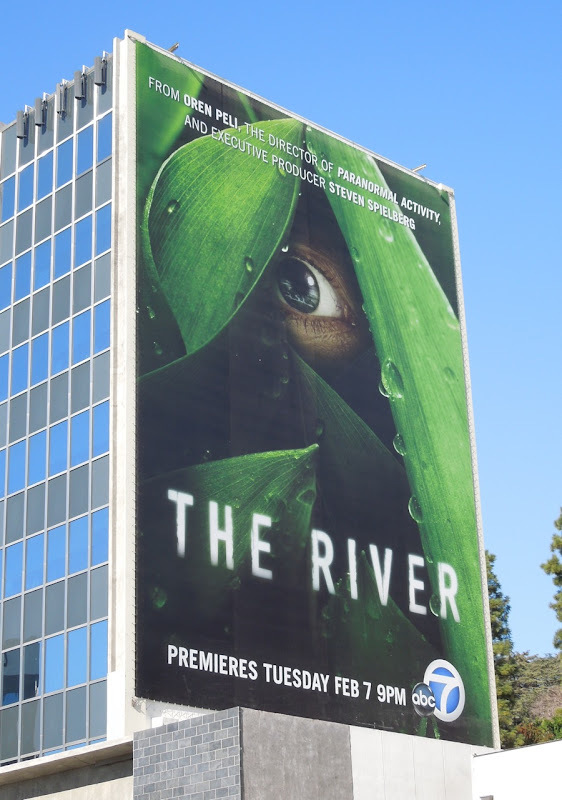 These vivid billboard creatives have that Blair Witch Project feel with the terrified eye peaking out between those luscious plant fronds and the green colour really makes these ads stand out amidst the cluttered L.A. skyline. 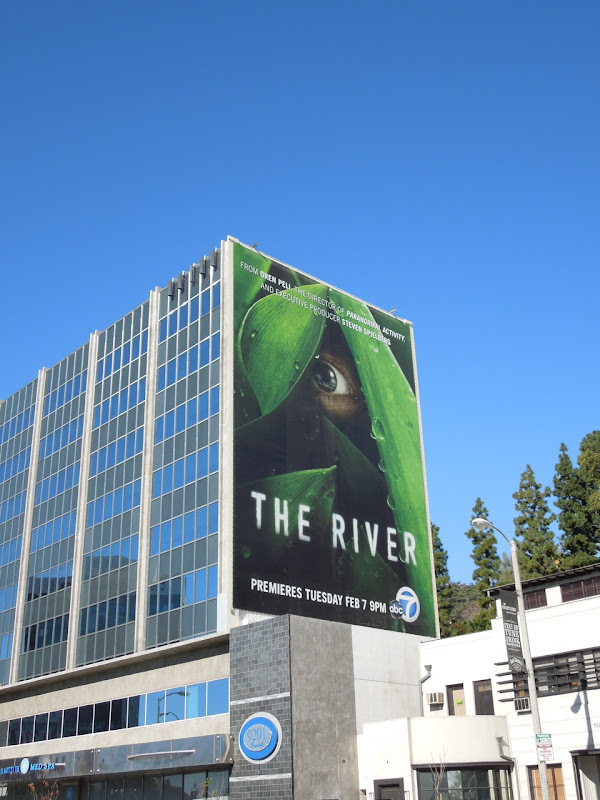 The new series follows 'Tess Cole', the co-host of The Undiscovered Country, her children and a documentary crew, as they venture deep into the Amazon to find her lost explorer husband, 'Dr. 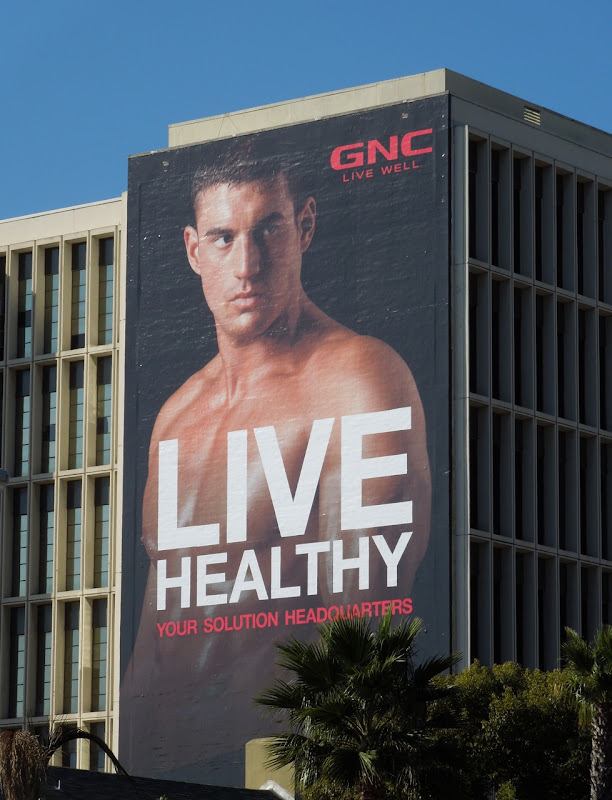 Emmet Cole', when his emergency beacon goes off six months after he was presumed dead. 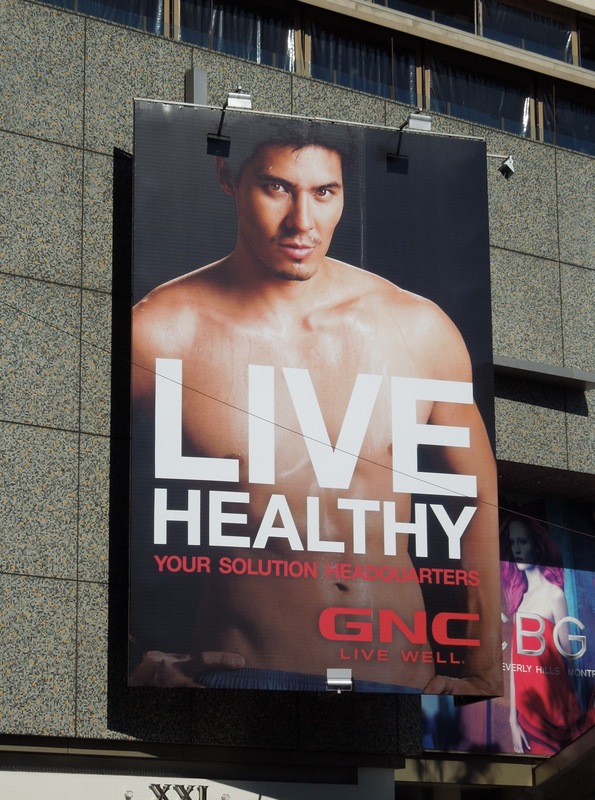 It'll all be captured on camera, so what could possibly go wrong. 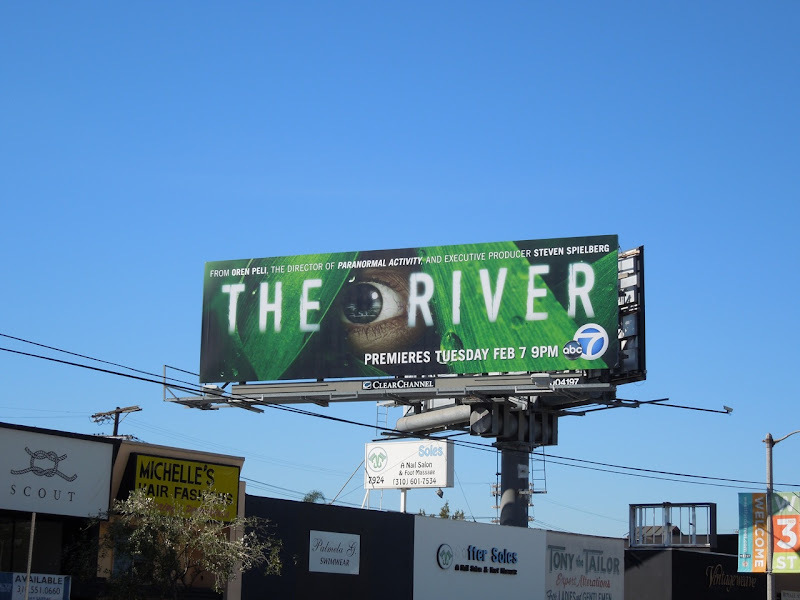 Is Daily Billboard the only one who thinks the placement of that eye in the landscape ad creatives make the title read 'The Driver' when you look at it quickly, it looks so much clearer but no less effective on the large portrait version. 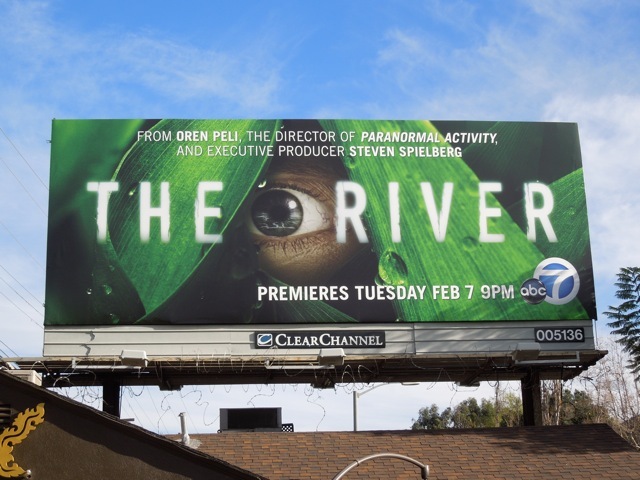 Another small gripe that Daily Billboard has is the use of Steven Spielberg's producer credentials for TV shows these days. 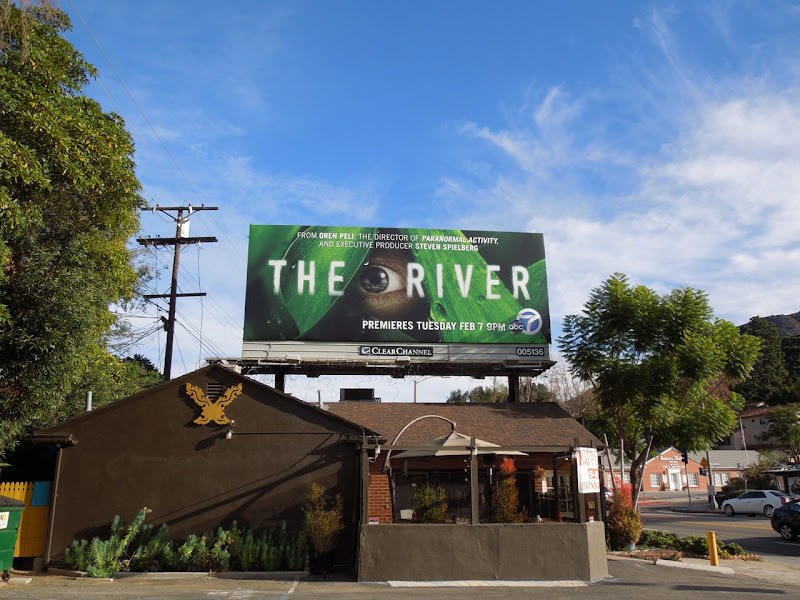 If he's busy overseeing the big screen escapades of War Horse and The Adventures of Tintin, plus other high-profile projects, just how involved can he possibly be in shows like The River. 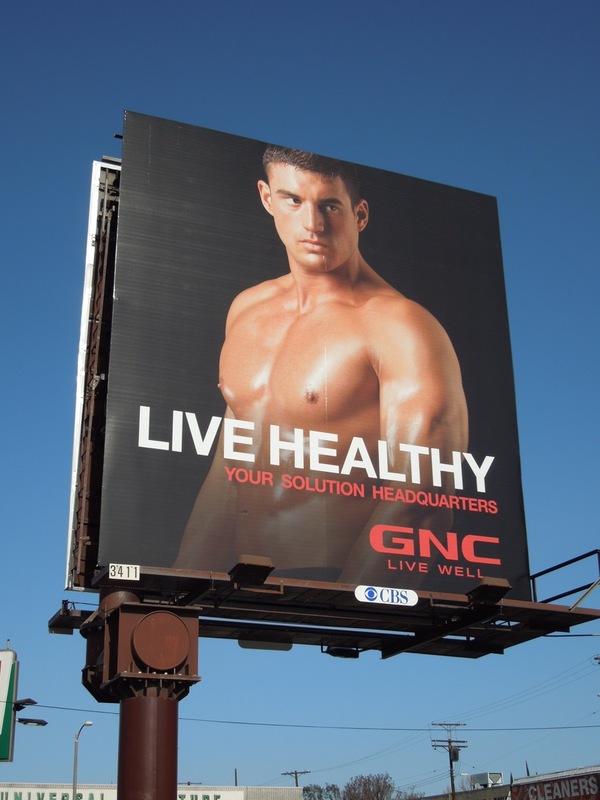 Regardless of these concerns, these slightly creepy and intriguing billboards should pique a lot of passersby interest. 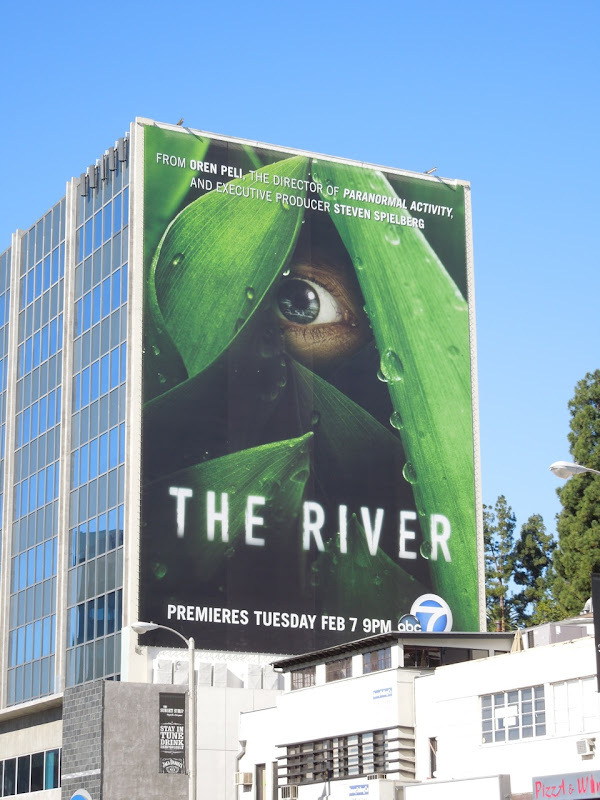 With the TV success of The Walking Dead and American Horror Story, it looks like there'll be even more horror-themed shows like The River on the small screen in the future. 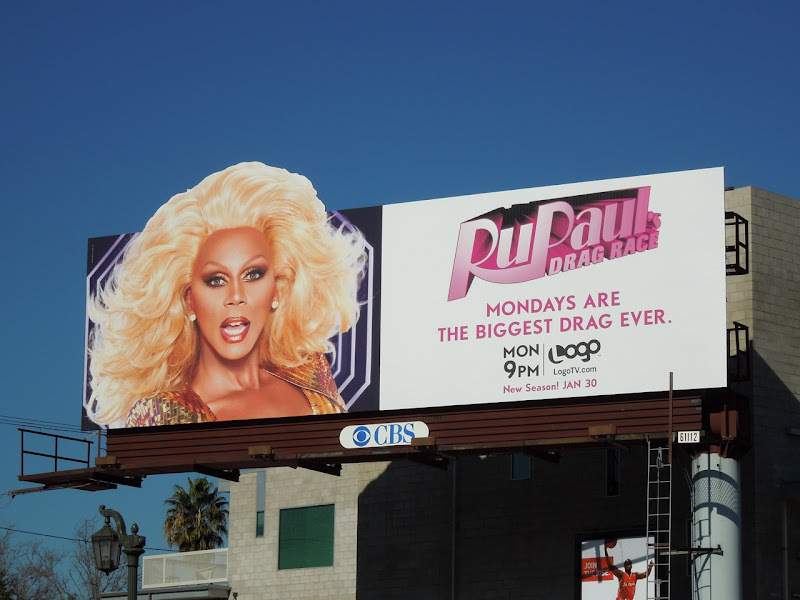 'Condragulations', drag diva RuPaul is back for a fourth fabulous season of RuPaul's Drag Race on Logo and just in time to usher in another TV WEEK here at Daily Billboard. 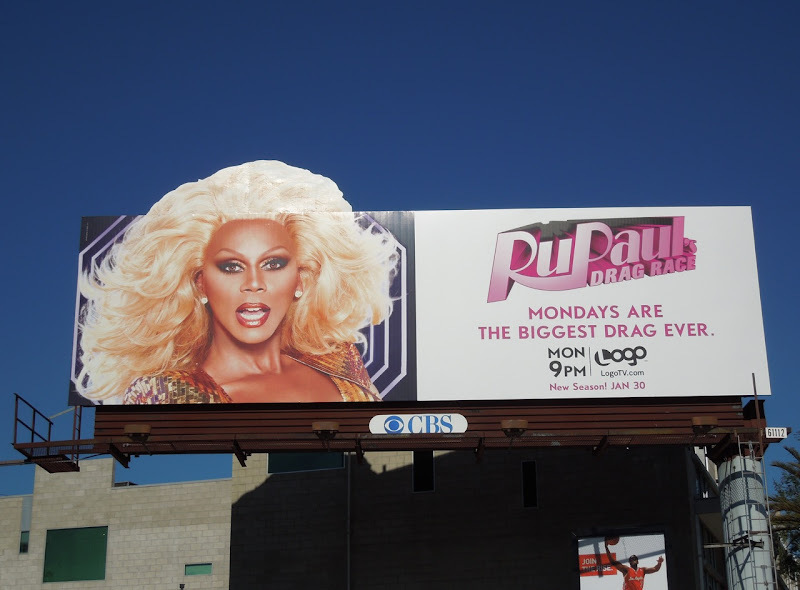 Reinvented in recent years as the Tyra Banks of the female impersonator world, she's on another quest to find America's next drag superstar and looking as fierce as ever above the skies of L.A. 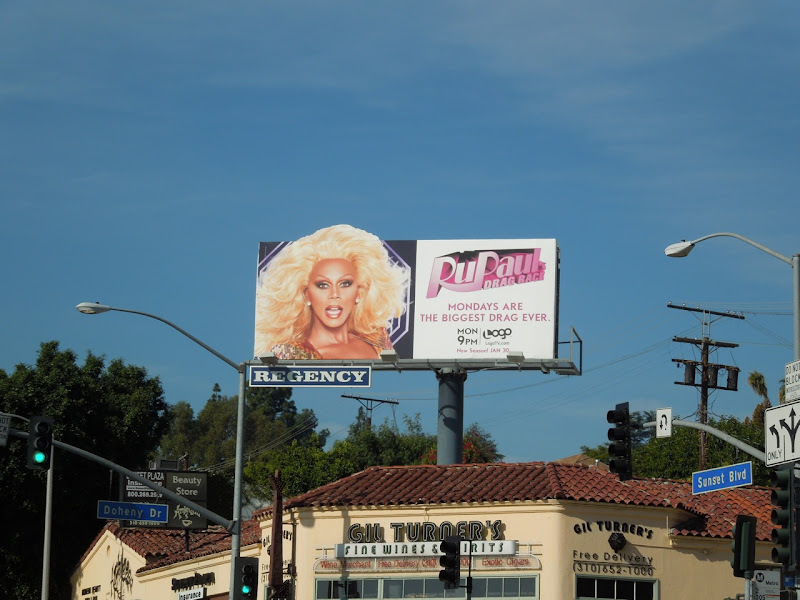 The Glamazon was spied on a special hair extension (pardon the pun) billboard at Melrose and Highland Avenues on January 12, whilst a mini-version was snapped along Sunset Boulevard at Doheny Drive on January 19, 2012. 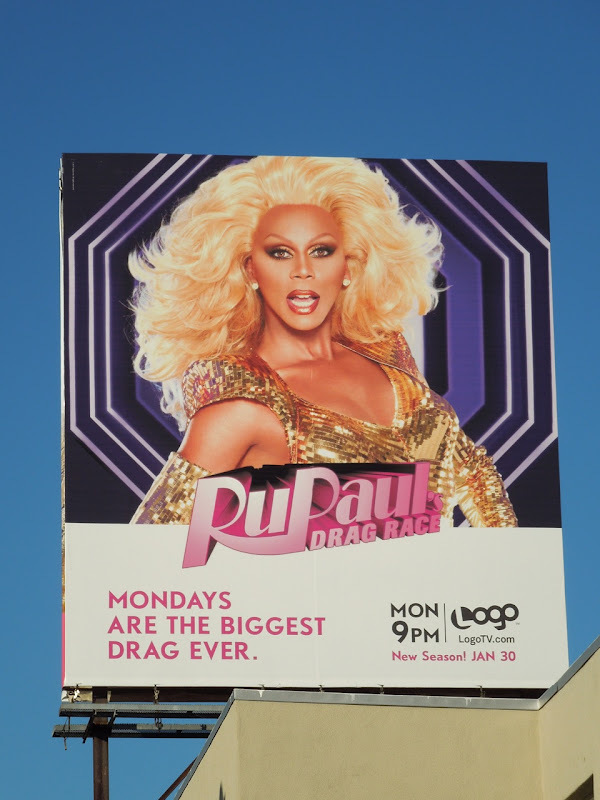 The supermodel was also spotted along Beverly Boulevard on a squarer format billboard which showed off more of her glittering golden attire. 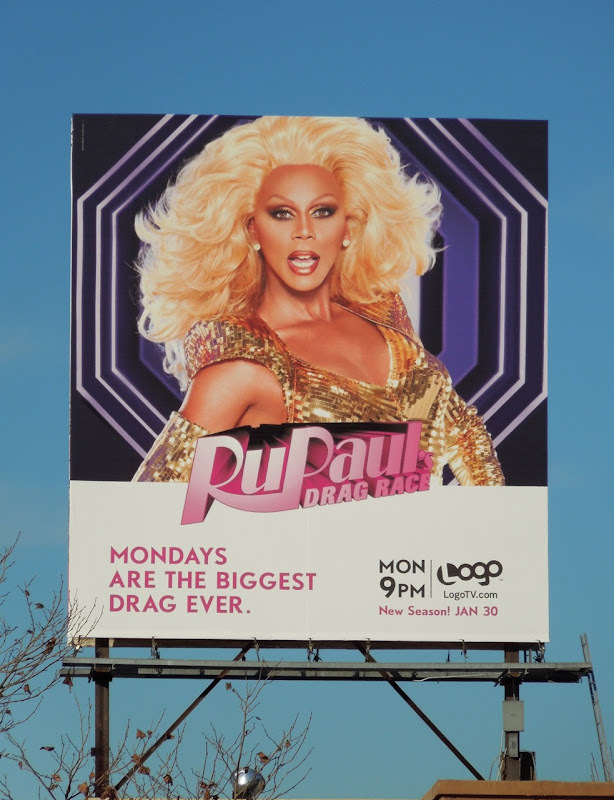 If you're a fan of the show, be sure to also check out the fabulous season two and season three billboards for RuPaul's Drag Race. 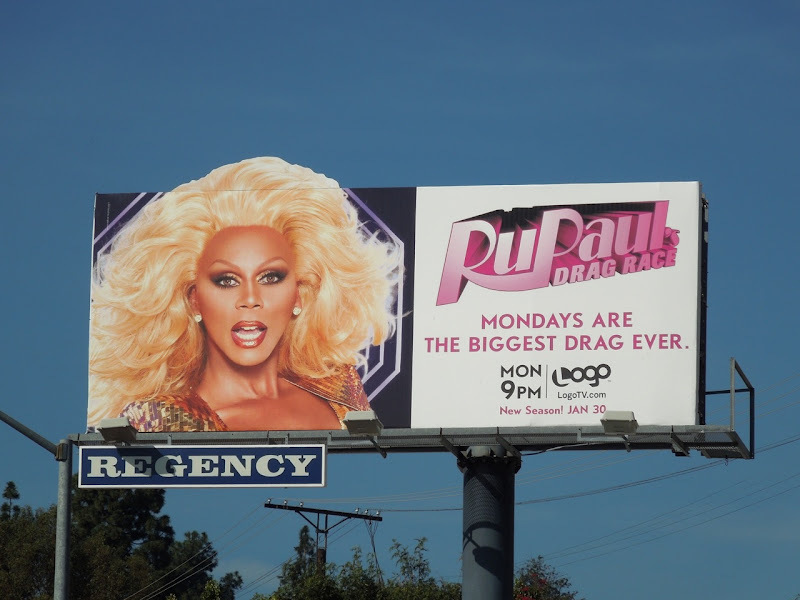 Mondays may be the biggest drag ever, but at least they are now the funnest (and most glamorous) way to start your week. 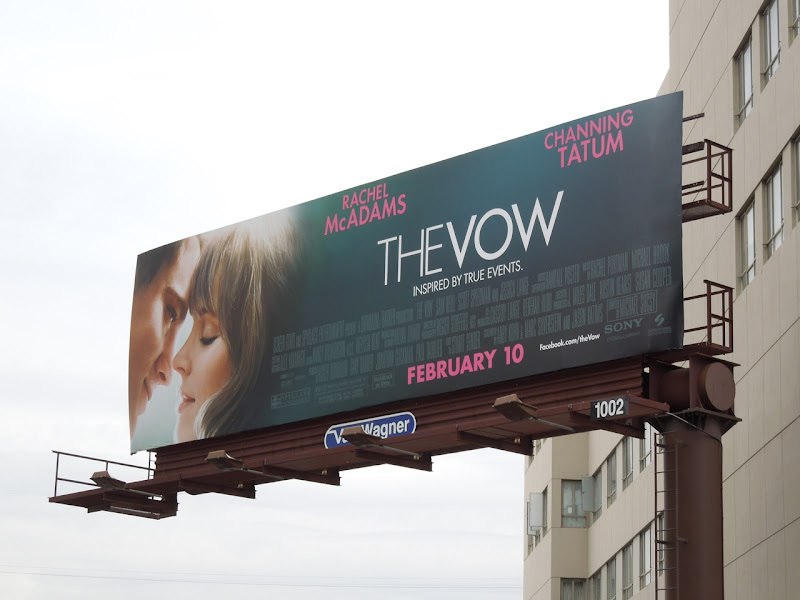 Valentine's Day is fast approaching and it looks like The Vow is determined to charm young lovers and romantics everywhere into cinema seats with all these billboards. 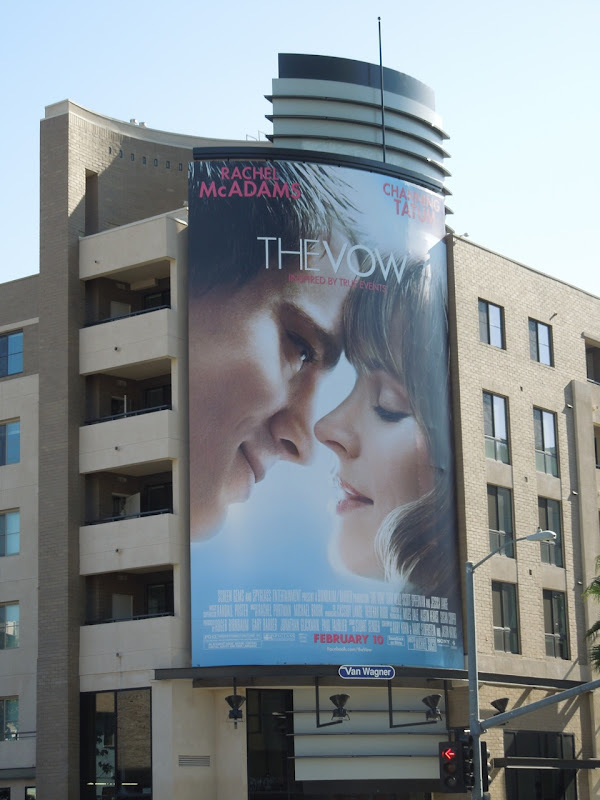 Rachel McAdams is the wife who awakes from a car accident with severe memory loss and Channing Tatum is the husband who must win her heart all over again. 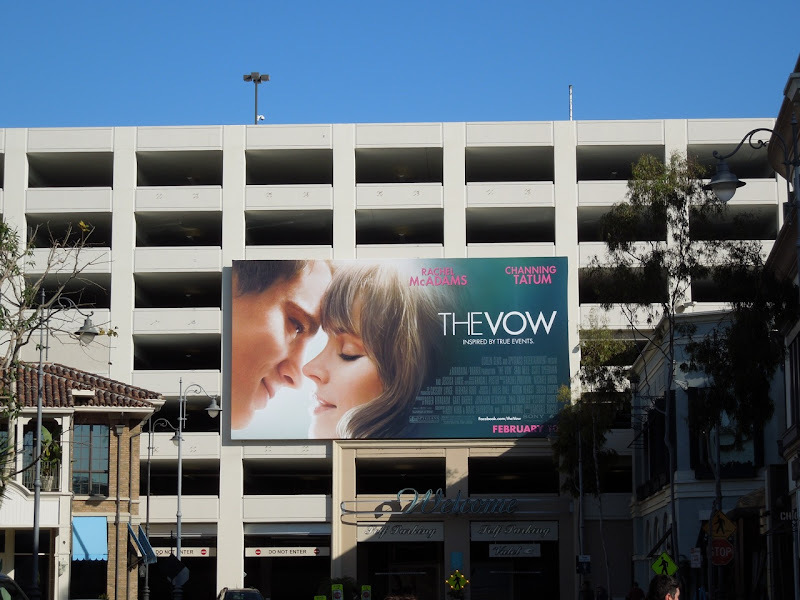 These ads, in all their formats, do a perfect job of communicating that this movie is a romantic drama. 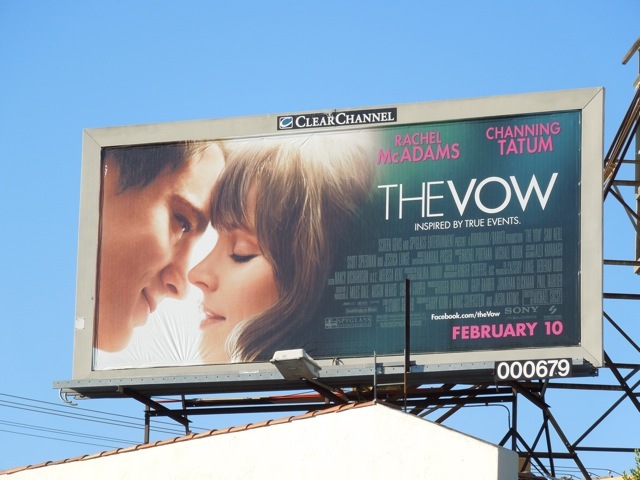 There's nothing like the anticipation of a kiss and story based on true events to get hearts aflutter and the tears flowing. 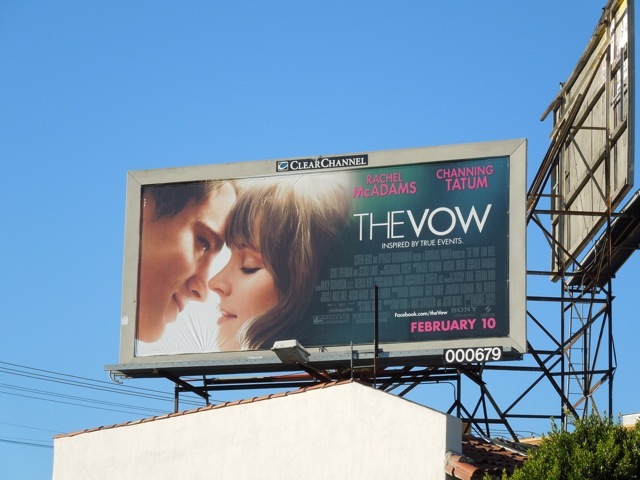 Daily Billboard also loves the complimentary green and pink colour scheme on this movie creative, of course it always helps when there's a gorgeous couple to ogle over too. 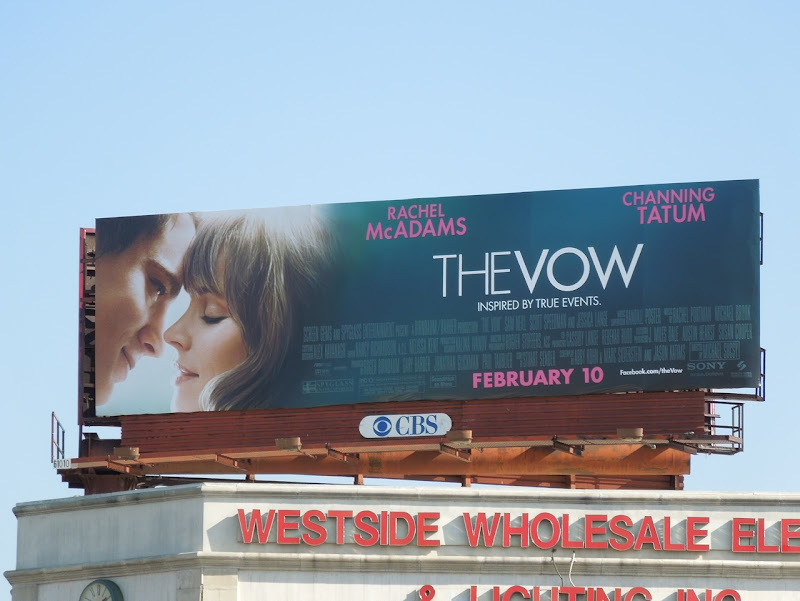 These billboards for The Vow were snapped around the streets of L.A. from January 9 through January 17, 2012, along La Brea Avenue, Wilshire Boulevard, Highland Avenue, Beverly Boulevard and at The Grove shopping center. 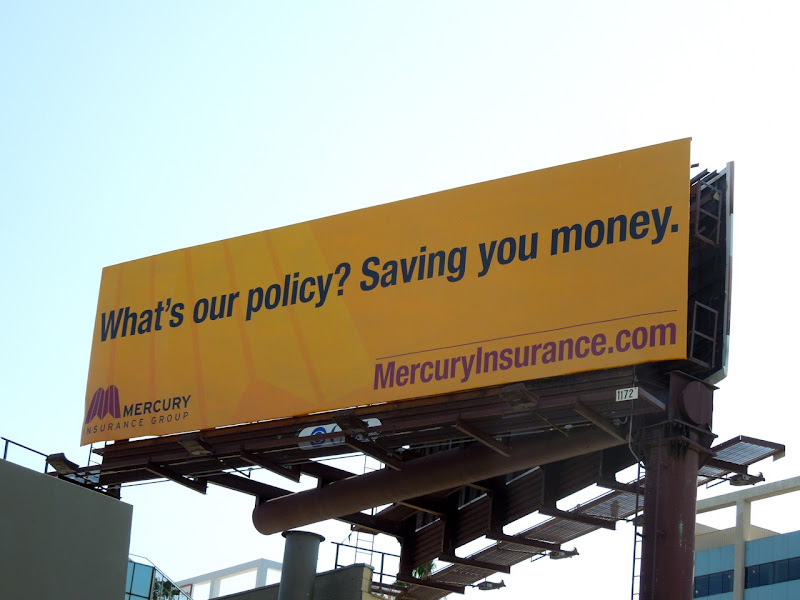 Daily Billboard thinks that Mercury Insurance's current ad campaign is simple and effective. 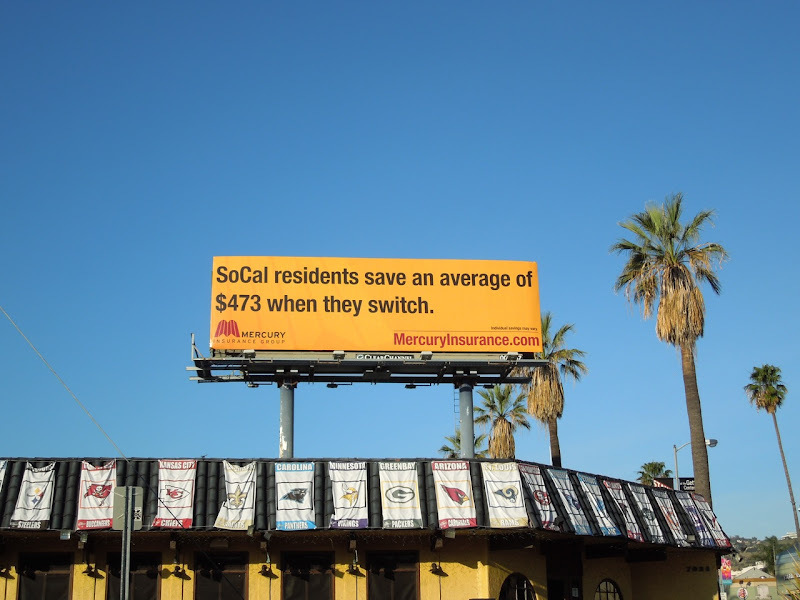 The billboards stand out not only because of the bright egg yolk colour, but also due to the use of some clever copy. 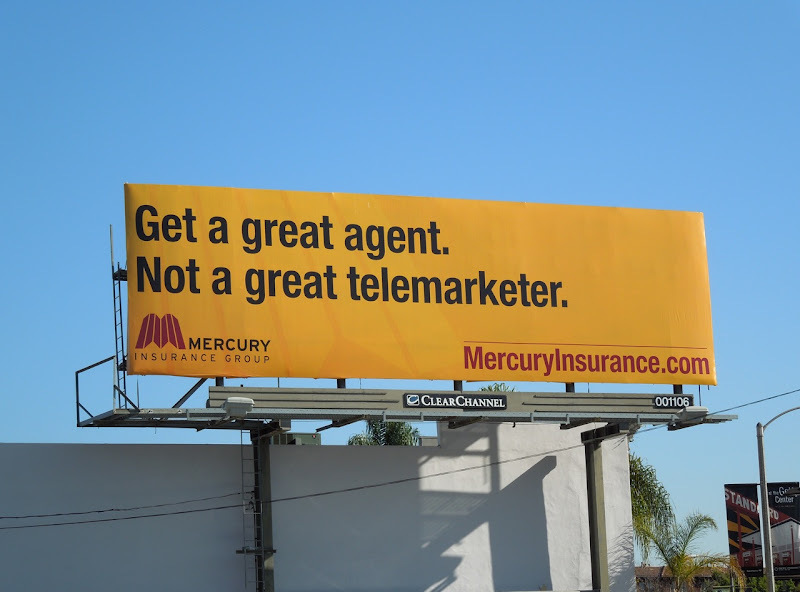 Daily Billboard especially likes the sentiment of the 'Get a great agent. 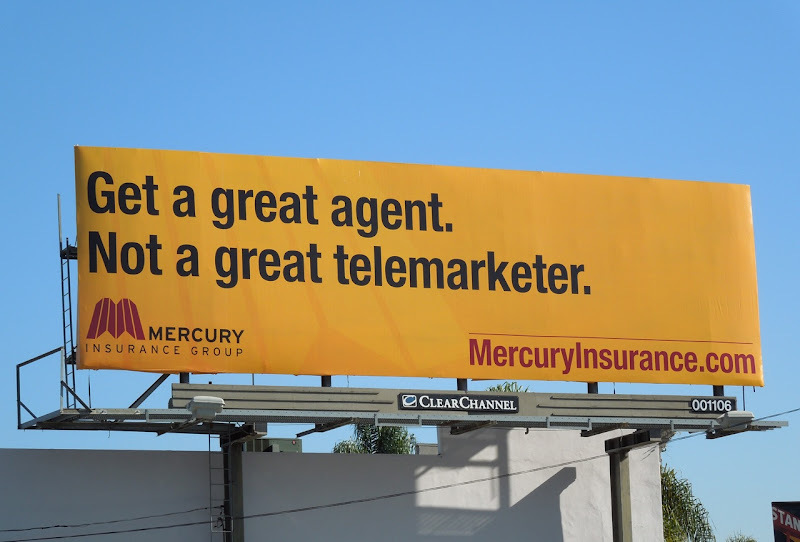 Not a great telemarketer' creative, but wonders in this age of overseas call centers and scripted, standard answers, if the service actually lives up to the promise. Regardless, the ads do a great job of the communicating the savings you'll apparently enjoy if you opt for Mercury Insurance Group. 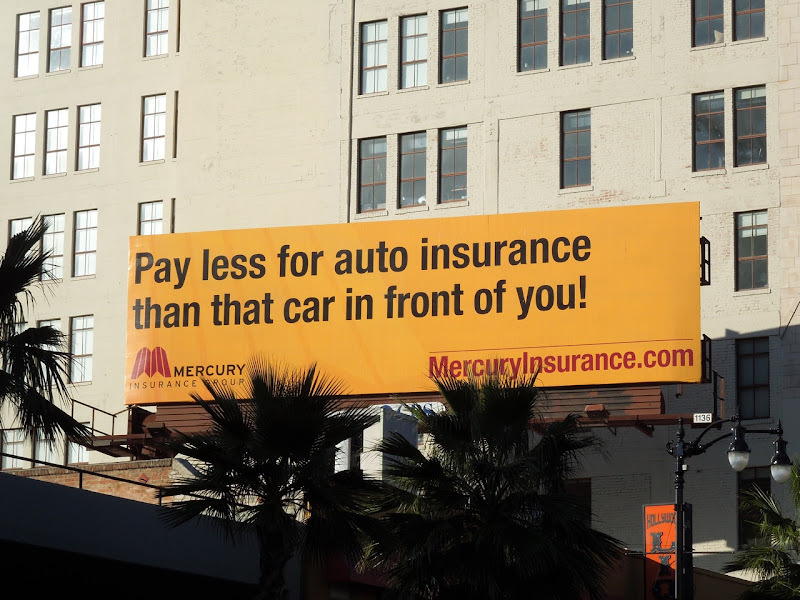 These insurance billboards were snapped along 3rd Street, Wilshire Boulevard, Hollywood Boulevard and Sunset Boulevard in L.A. on January 12 through January 16, 2012. 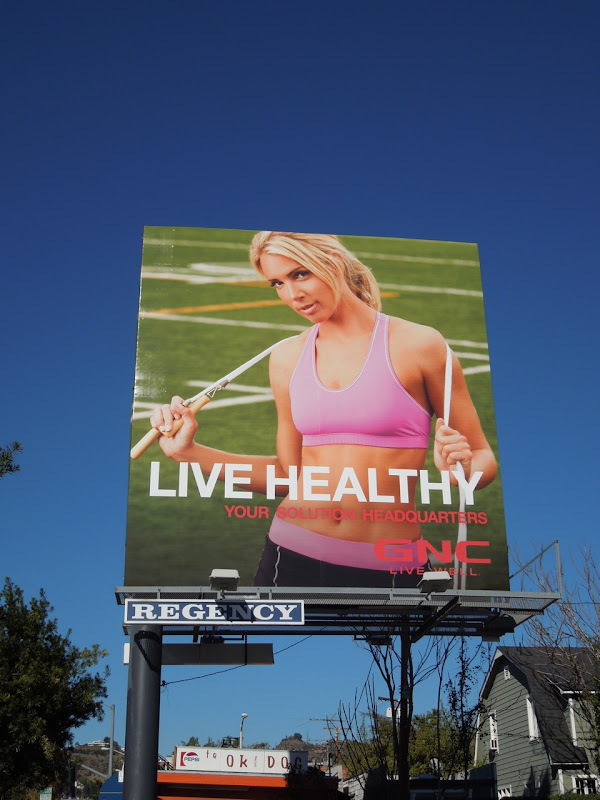 For more examples of billboards with no images and a great use of copy check out these Chipotle Mexican Grill billboard ads. 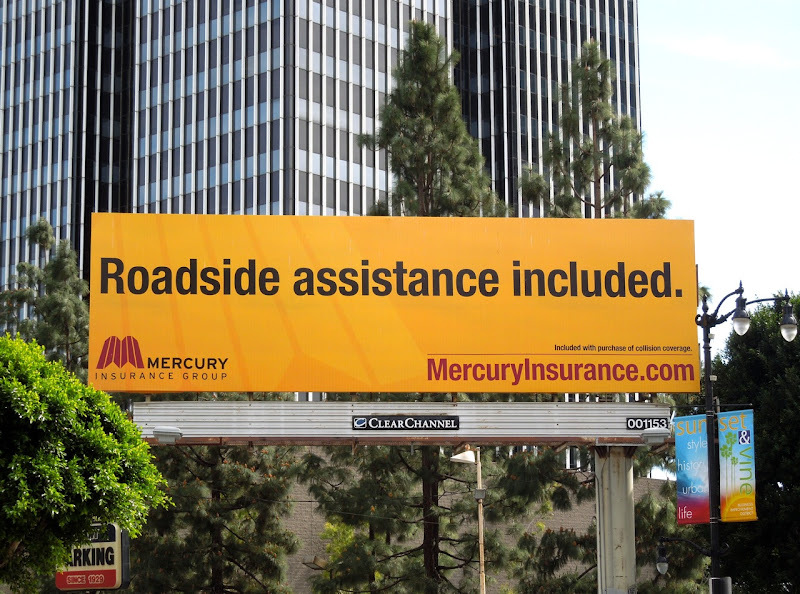 UPDATED: One more billboard from the campaign, this one about roadside assistance, snapped along Vine Street in Hollywood on February 12, 2012. 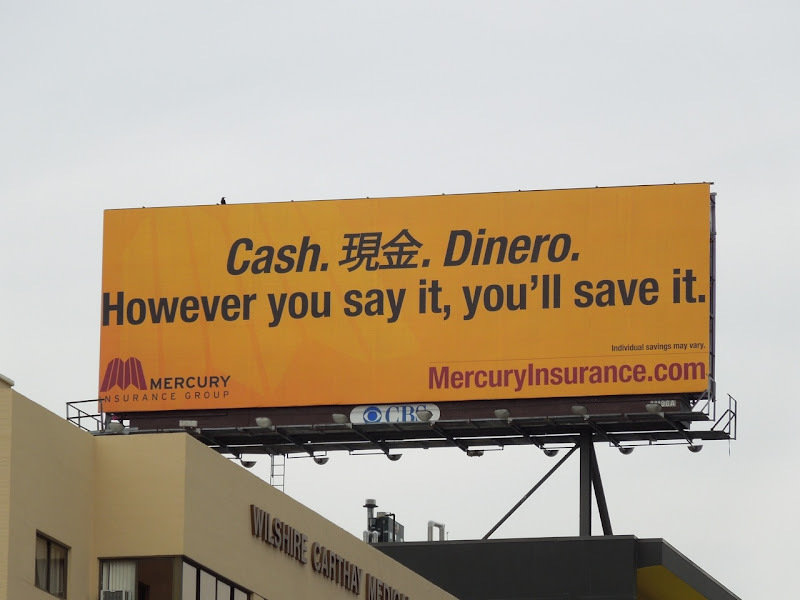 UPDATED: Here's another billboard in the Mercury campaign snapped along Ventura Boulevard in Sherman Oaks on February 23, 2012. 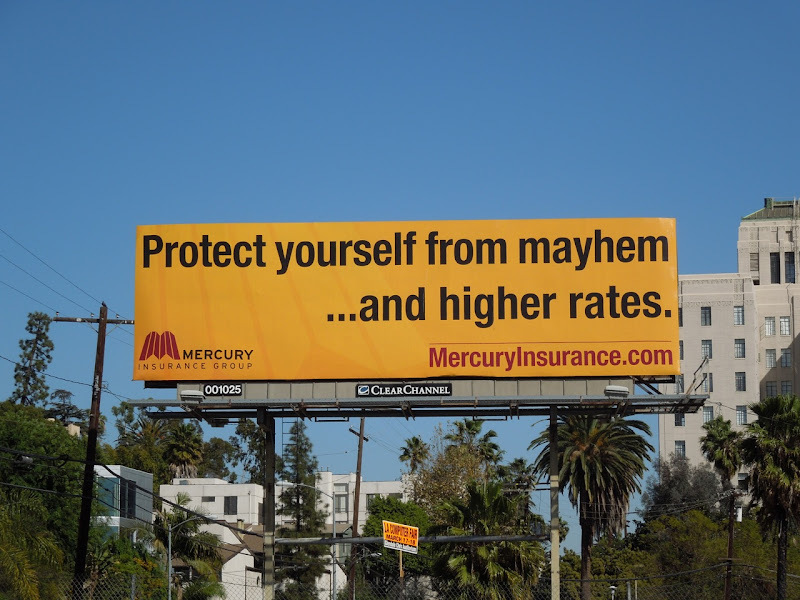 UPDATED: Enjoy two more ads from Mercury Insurance snapped along La Brea Avenue and Highland Avenue on March 7, 2012. 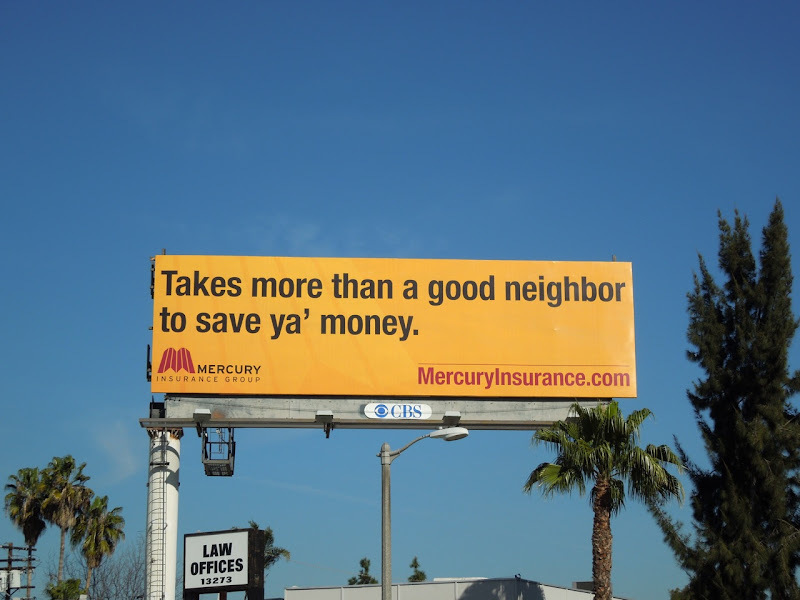 There seem to be a never-ending supply of creatives for this copy only campaign, so I'm sure we can expect even more versions in the months to come. 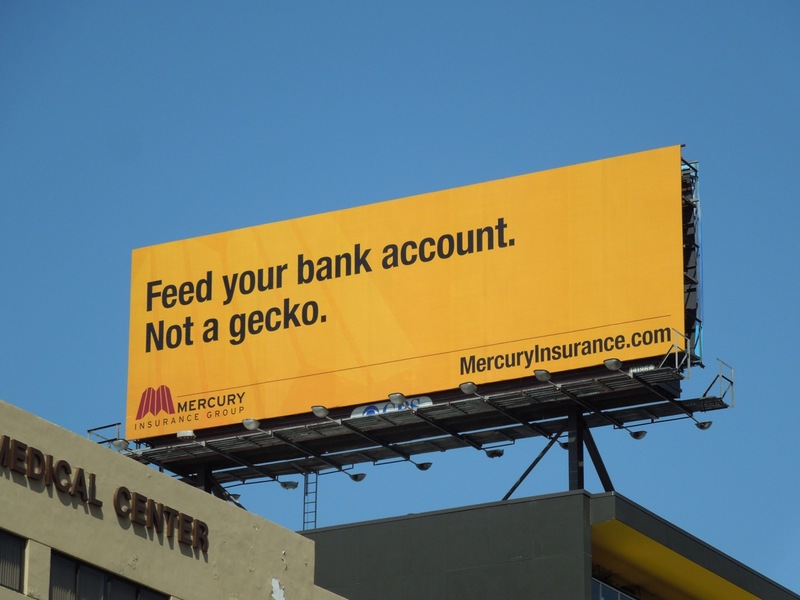 UPDATED: Here's a new creative from Mercury which seems to poke fun at its competitor Geico, snapped high above Wilshire Boulevard on May 6, 2012. 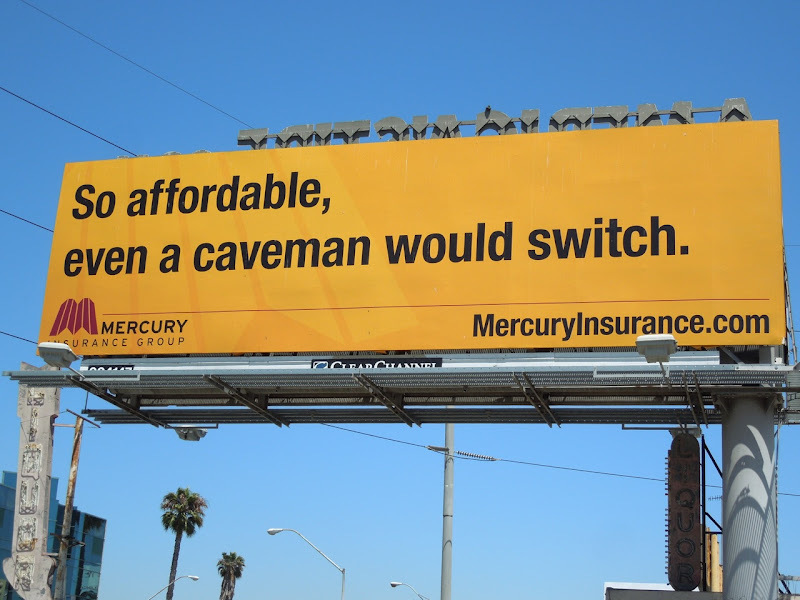 UPDATED: Finally managed to snap the witty 'Caveman' creative, another billboard bashing an older Geico ad campaign, along Century Boulevard by LAX on June 29, 2012. 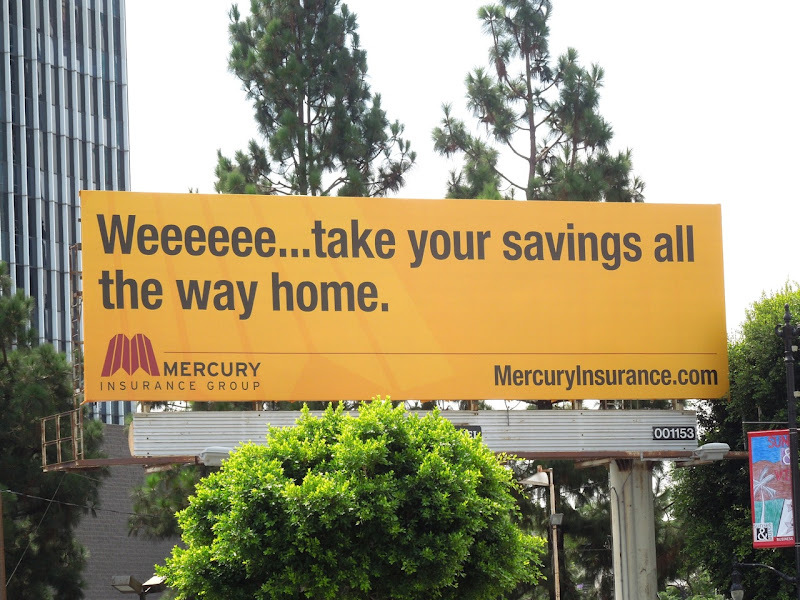 UPDATED: Here's another whimsical ad creative from Mercury Insurance, this one paying homage to the Three Little Pigs fable, snapped at Sunset & Vine in Hollywood on August 17, 2012. 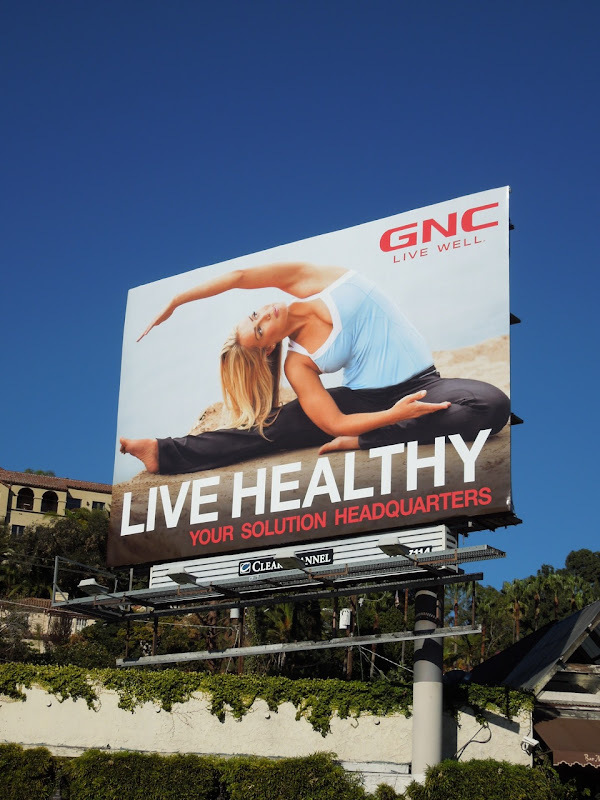 Katherine Heigl is back on the big screen and this time she's not blonde, and even more surprisingly she's a bail-bond bounty hunter. 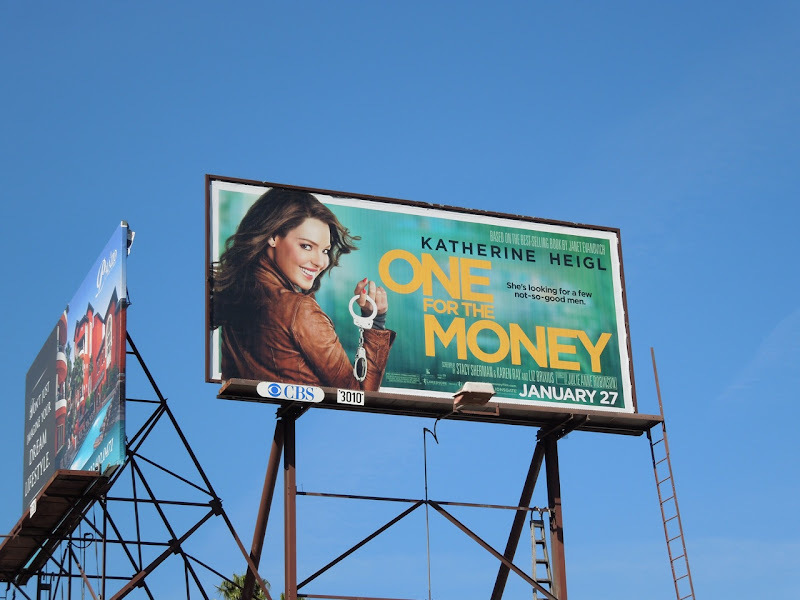 In this action comedy, the former Grey's Anatomy actress brings 'Stephanie Plum' to life, the star of Janet Evanovich's 1994 best-selling book of the same name, One for the Money. 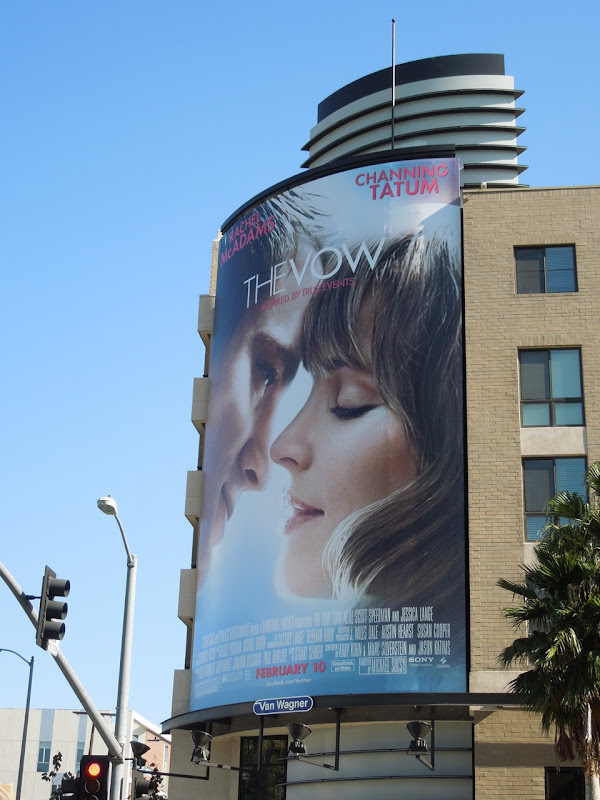 These colourful movie billboards were snapped along Beverly Boulevard on January 10 and La Brea Avenue on January 17, 2012. 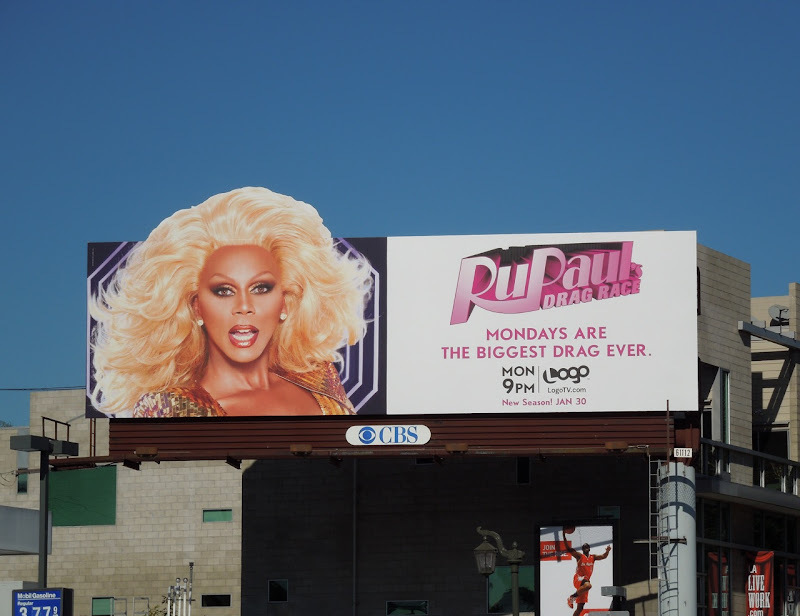 Given her box office history, maybe she'll handcuff the audience to their seats to get them to watch. 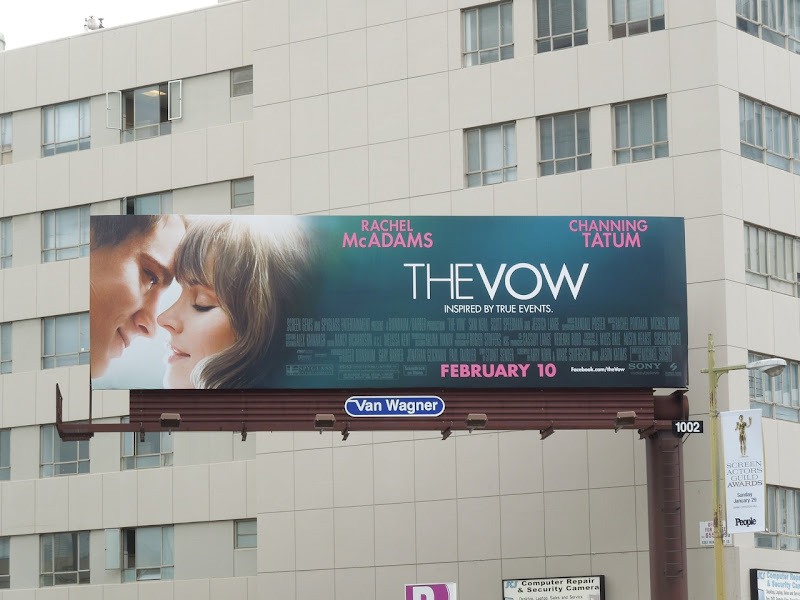 January is obviously the season for billboards where movie stars stare out at you intently. 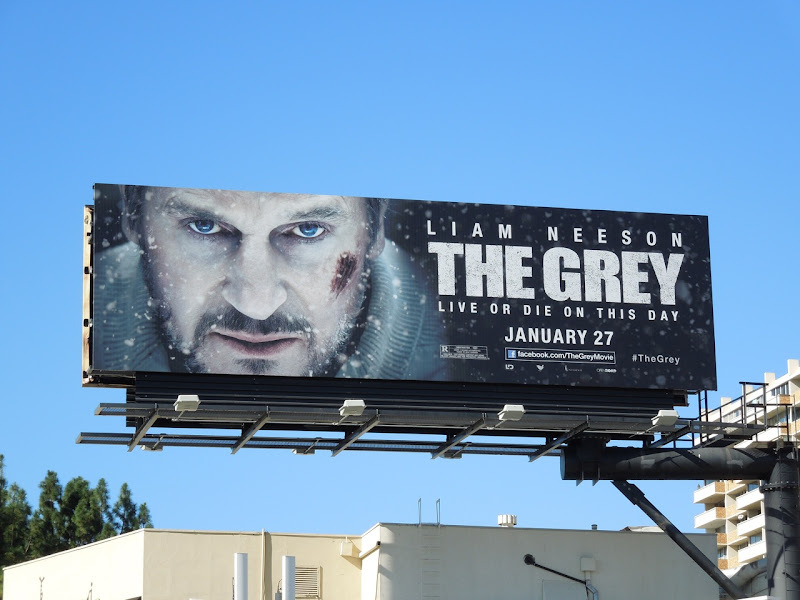 Earlier this week it was Denzel Washington for Safe House and today it's Liam Neeson for his new survival thriller, The Grey. 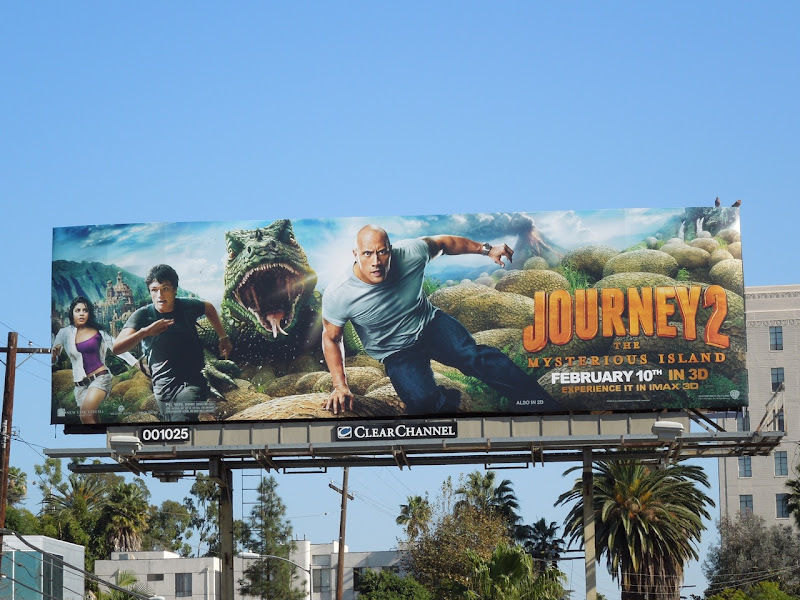 It always makes Daily Billboard wonder if there's anything more interesting about the film they could be conveying, aside from the lead actor's handsome face. 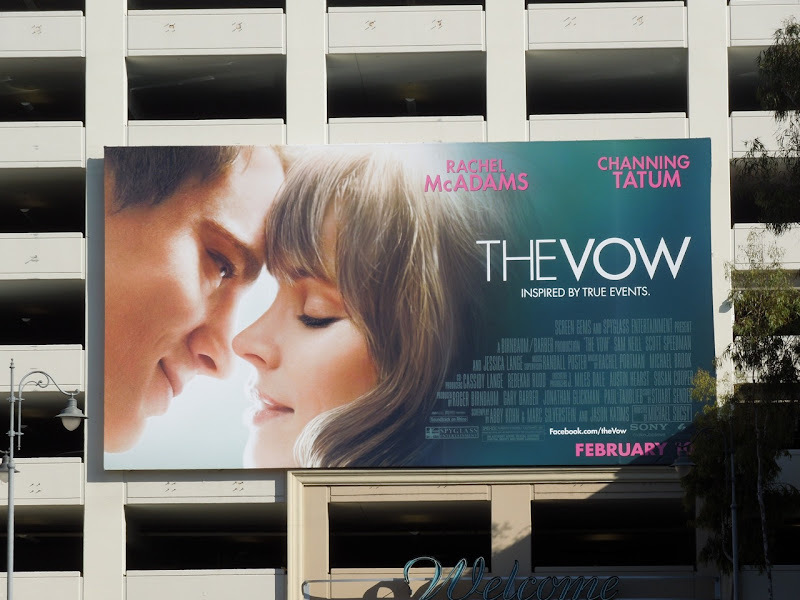 For instance this movie is about an oil drilling team whose plane crash lands in Alaska and have to survive when they are hunted by a pack of wolves. 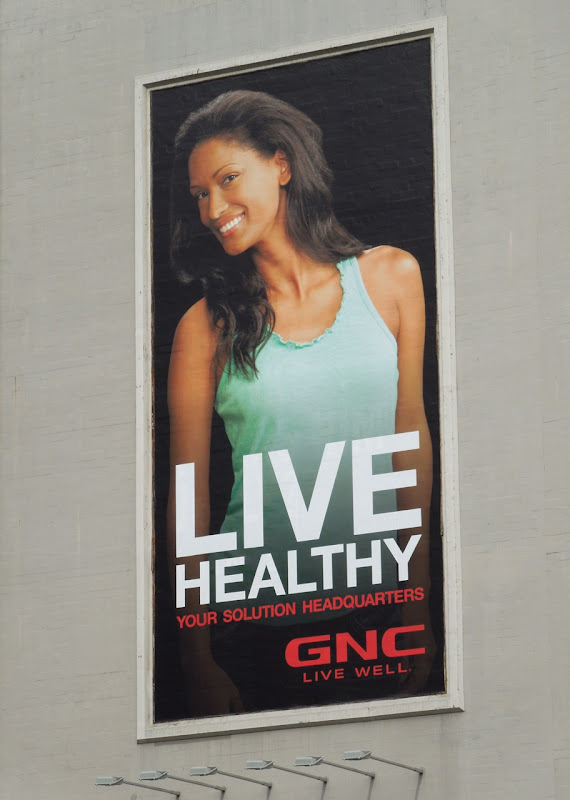 Did you get that from this advert, even with the 'Live or die on this day' tagline? 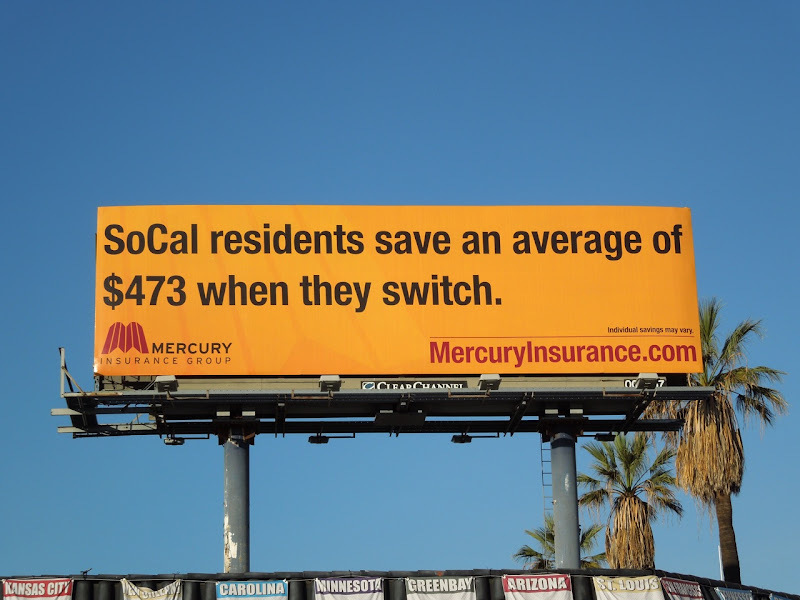 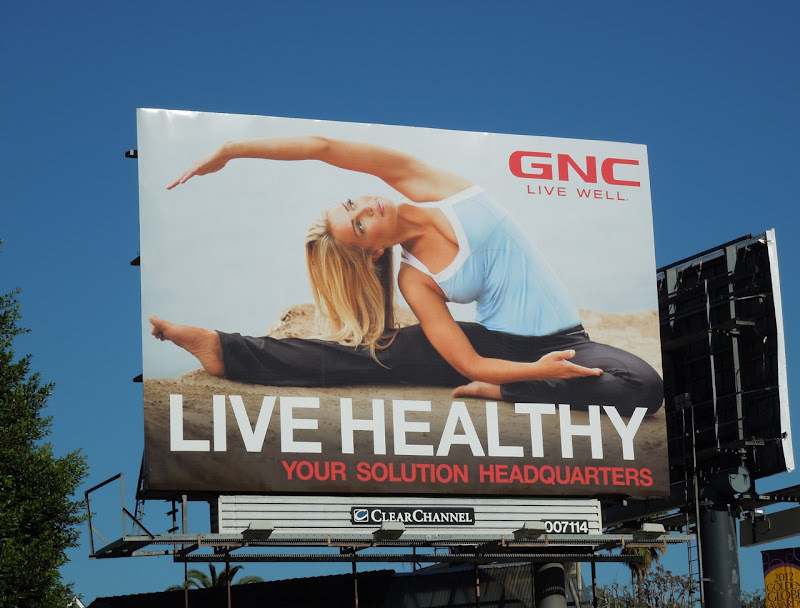 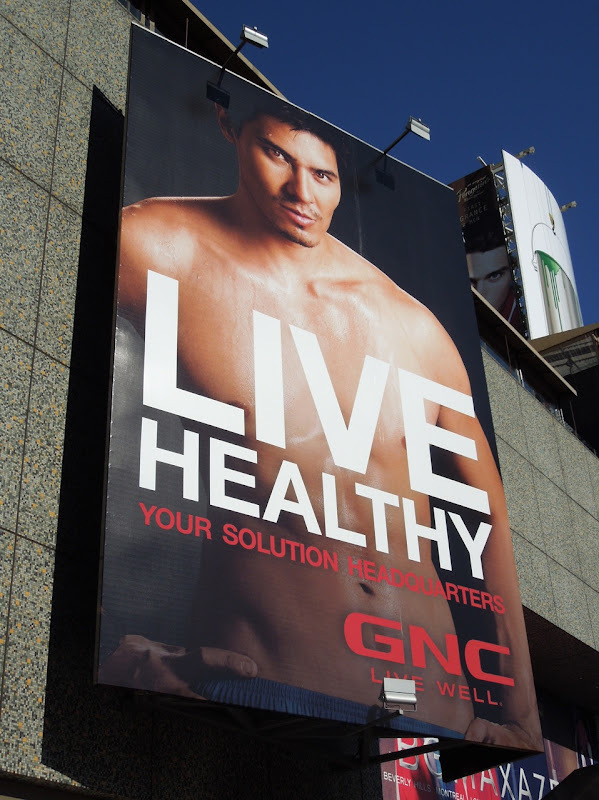 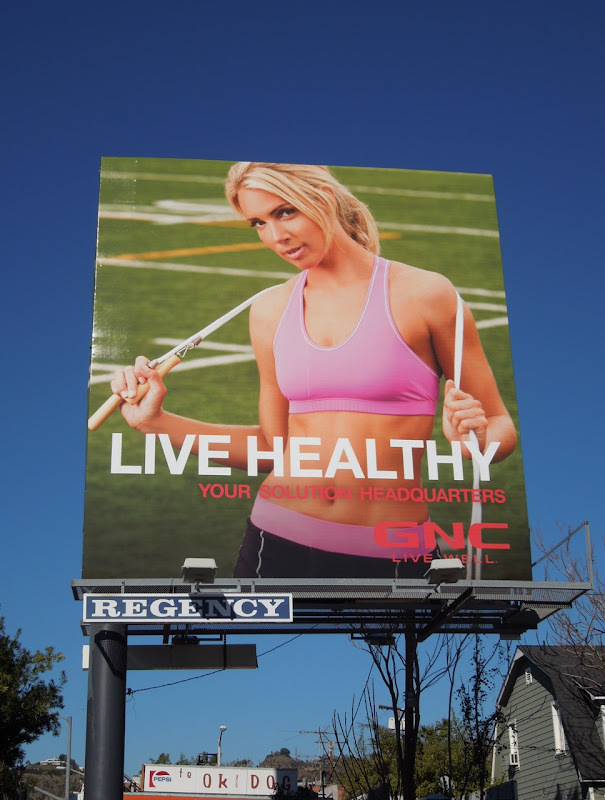 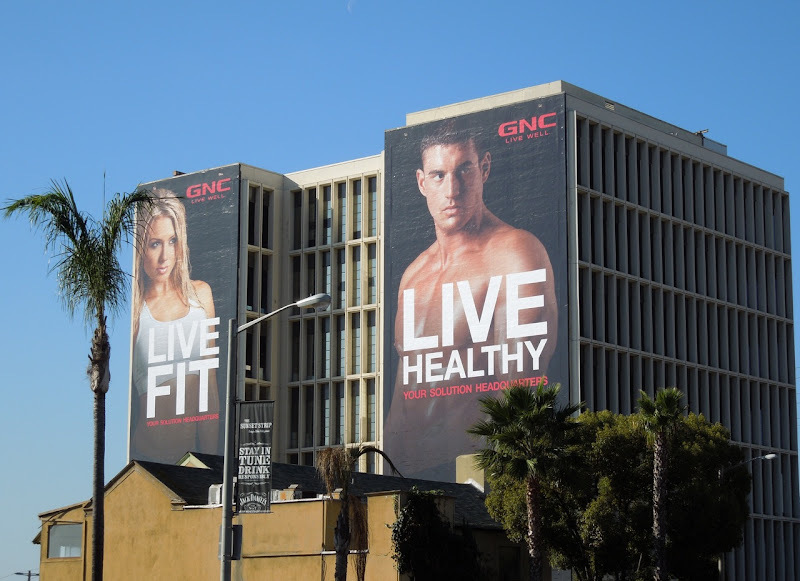 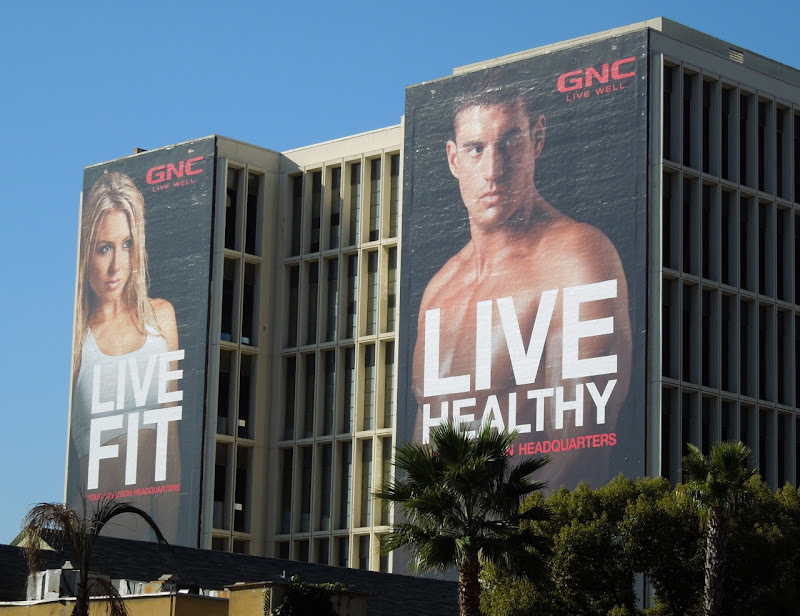 This snowbound billboard was snapped along Sunset Plaza on January 13, 2012. 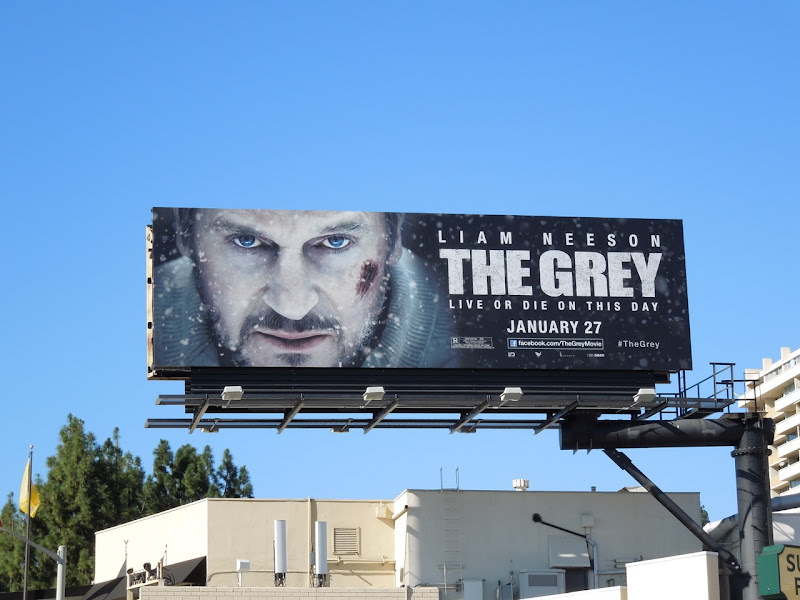 If you're a Liam Neeson fan, be sure to also check out these Unknown movie billboards from February 2011. 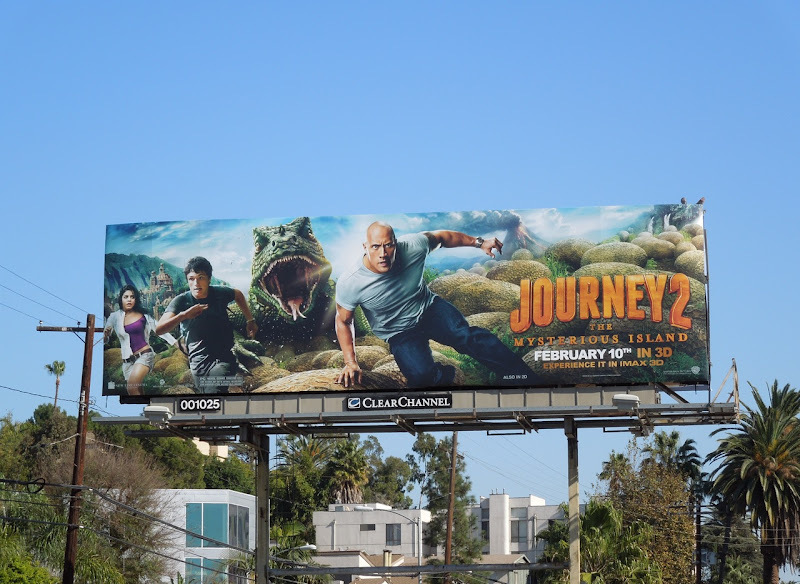 Daily Billboard is loving these colourful and fantastical billboards for Journey 2 The Mysterious Island around L.A. this month. 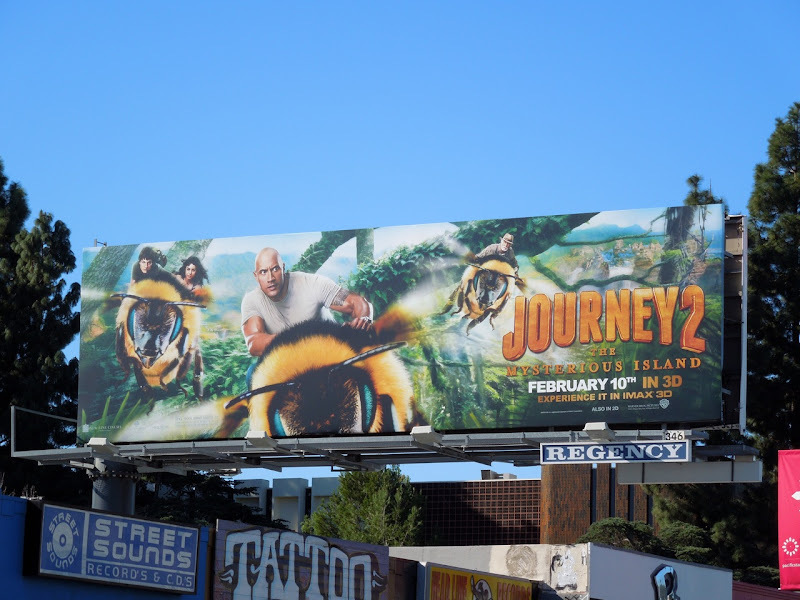 There's nothing like people flying on the backs of giant bumble bees or running from prehistoric lizards to catch your attention, or your imagination. 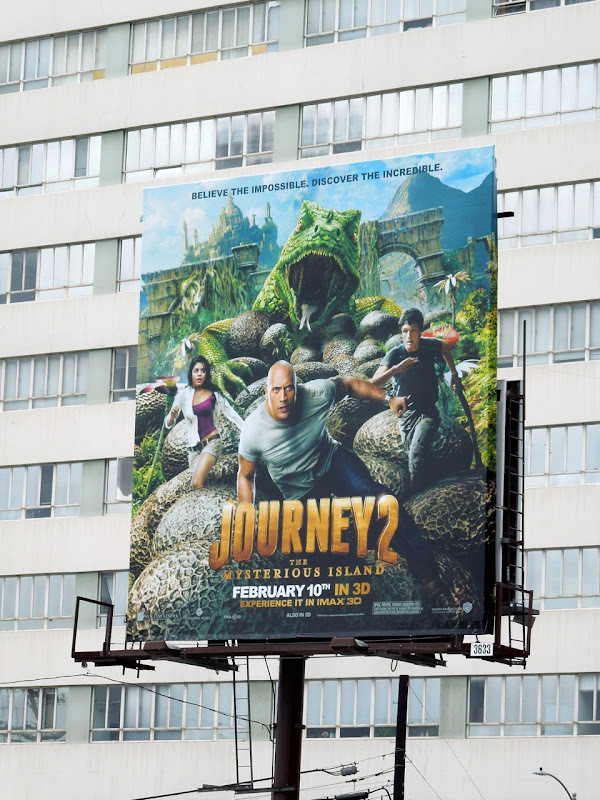 Dwayne 'The Rock' Johnson, Vanessa Hudgens and Michael Caine join Josh Hutcherson in this sequel to 2008's Journey to the Center of the Earth. 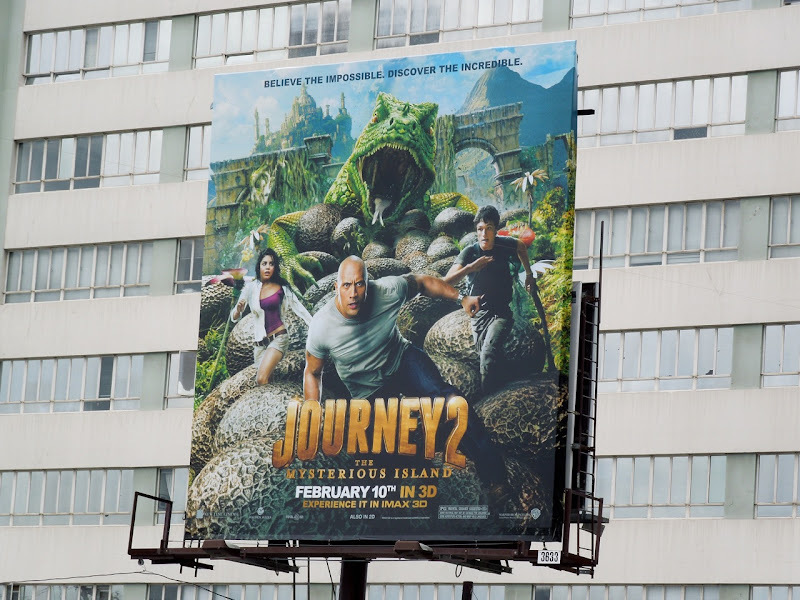 These fun, adventurous billboard ads certainly live up to the theme of an island filled with mystery, let's hope the movie doesn't disappoint either. 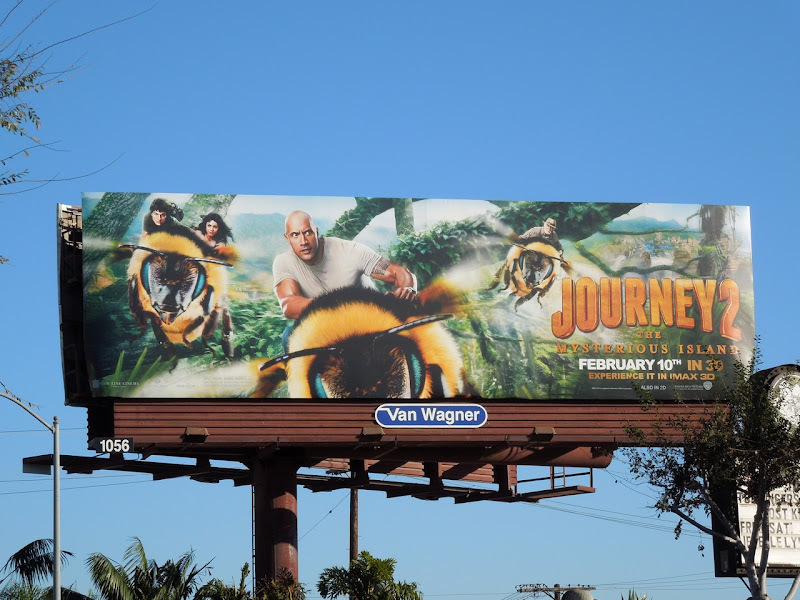 Literally all over Los Angeles at the moment, these fantastic movie billboards were snapped along Wilshire Boulevard, Melrose Avenue, Beverly Boulevard, Highland Avenue and Santa Monica Boulevard on January 13, 2012. 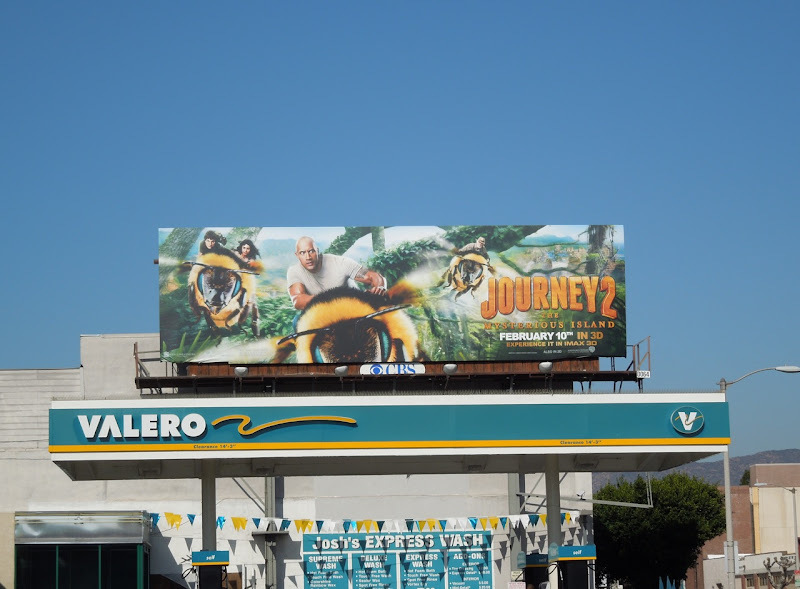 Be sure to also check out Vanessa Hudgens in these Sucker Punch film billboards and Dwayne Johnson in these Fast Five movie billboards.